Marsh, James H.. "Banks Island". The Canadian Encyclopedia, 25 January 2018, Historica Canada. https://www.thecanadianencyclopedia.ca/en/article/banks-island. Accessed 21 April 2019. Banks Island, 70 028 km2, fifth-largest island in Canada, is the westernmost island of the Arctic Archipelago. Banks Island, 70 028 km2, fifth-largest island in Canada, is the westernmost island of the Arctic Archipelago. 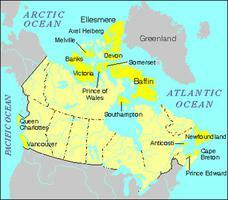 Within the Northwest Territories, it is bordered on the west by the Beaufort Sea and separated from Melville Island on the north by M'Clure Strait and from Victoria Island on the east by Prince of Wales Strait. The southeast coast is marked by dramatic cliffs of yellow, white and red quartzites. The low west coast is characterized by long, sandy offshore bars, rising at the southwest tip to the spectacular Nelson Head cliffs (425 m) of Precambrian rock almost 2 billion years old - 325 million years older than any other part of the island. Limestone cliffs rise at Cape M'Clure and Cape Crozier on the north coast. Along the east coast the land slopes up from the beach into mud, sand and gravel cliffs. The highest point is Durham Heights (almost 730 m). The central portion is a level plain, cut by valleys of the larger rivers (Big, Bernard and Thomsen) that rise near the southeast side. The Thomsen is Canada's most northerly river navigable by canoe. It is the centrepiece of Aulavik National Park. Seams of hard, impure coal underlie the northeast plateau, and softer coal has been found around Mercy Bay. On the east side, which was glaciated, lakes are numerous and glacial till covers the hills. There is a large arctic fox population, as well as caribou, polar bears, wolves, muskoxen, arctic hare, lemmings, ermine, seal and occasionally grizzly bears. White and bowhead whales are common offshore. Numerous species of birds are found, including lesser snow geese, black brants, eiders, peregrine falcons, snowy owls, rough-legged hawks and ravens. There are 2 bird sanctuaries on Banks Island: one along the banks of the lower Thomsen River and the larger of the 2 comprising the southwest quarter of the island surrounding Sachs Harbour. Arctic char have been taken at the mouths of the Sachs, De Salis and Thomsen Rivers; whitefish and lake trout at the Thomsen. Banks Island was first sighted by Lieutenant Frederick Beechey, a member of the Sir William Parry expedition (August 1820), and named for Sir Joseph Banks, president of the Royal Society in Britain. 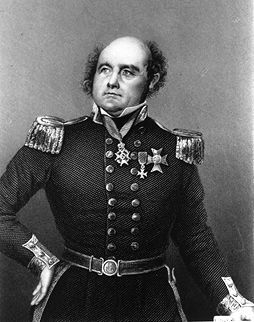 Robert McClure landed on the south coast in 1850 and overwintered in Prince of Wales Strait. The following year, his ship the Investigator became locked in ice on the island's north coast and he and his crew spent another 2 winters off Banks Island, this time in Mercy Bay, before being rescued. His abandoned ship was found in shallow water in the summer of 2010. 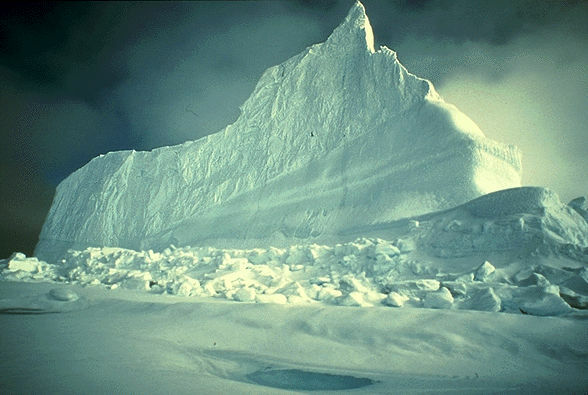 Vilhjalmur Stefansson reached the island across the ice of the Beaufort Sea and established a base near Cape Kellet. The island was inhabited sporadically for more than 3000 years, first by the Pre-Dorset, then by the Thule and Copper Inuit. There is evidence of their occupation along the southwestern and southeastern coasts and along the Thomsen River. Today, except for an air base at Sachs Harbour, Banks Island is uninhabited except for trappers.